KOKOMO, Ind. — Indiana University Kokomo's Lady Cougars volleyball team and fans traded in IU red for pink Tuesday, October 2, in honor of breast cancer awareness. Women's Volleyball - Breast Cancer Awareness Game. See flickr slideshow. A sea of fans in pink Cougars T-shirts filled the Maple Crest Middle School gym to cheer for the team as they battled the Anderson University Ravens. 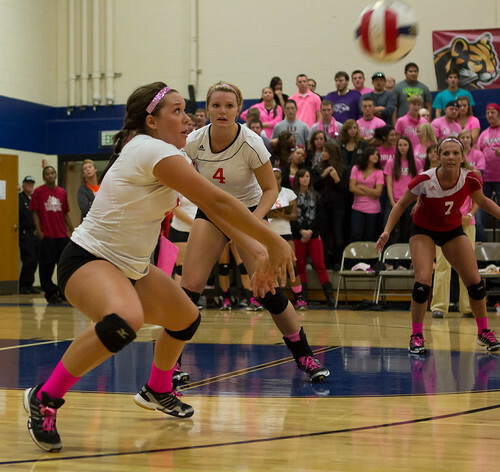 Volleyball team members were in the spirit too, wearing hot pink socks and sparkly pink headbands with their uniforms. Mary Olk, collegiate coordinator for the Student Athletic and Wellness Board, which co-sponsored the event with the Medical Imaging Club, said it is important to reach out to college-aged women to let them know about the need for annual mammograms. "Better awareness is key in the fight against breast cancer," she said. "We want to make everyone aware of the need for mammograms, and of the need for donations for breast cancer search. We also want to show support for those who have fought breast cancer." Jessica Henderson, assistant professor of health sciences, welcomed fans to the game, and thanked them for their support. She was diagnosed with breast cancer 17 years ago. "As a breast cancer survivor, it excites me to see all the fans out there in their pink," she said. "Each woman diagnosed with breast cancer fights alone, but we can stand behind them." She encouraged everyone to read information in the game program about how to donate to breast cancer research. "This is helping our mothers, our daughters, and our sisters," she said. "We need funding for research, so we can cure breast cancer and find ways to prevent it." The Medical Imagine Club distributed gift bags, as a reminder to women to get annual mammograms. Advanced Medical Imaging donated giveaways for the bags, including a shower card showing the correct way to do a breast self-exam. Hollie Boyles, club president, said as future medical imaging professionals, they have a responsibility to educate people. "With the technology we have available, we're able to detect breast cancer much earlier than before," she said. "We're helping save lives, but we can't do that if people don't know to take advantage of it. This is a way to give back to our community, for its support of IU Kokomo."